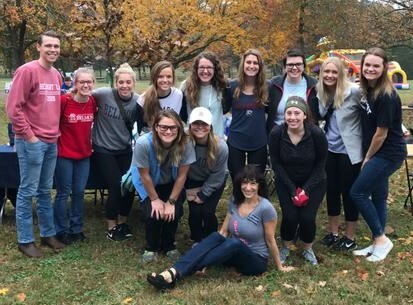 Belmont’s Occupational Therapy Doctorate students recently attended the Nashville Buddy Walk at the Hermitage. While there, the group helped with activities, passed out t-shirts and made Thanksgiving Day thank-you cards with the kids for their parents and caregivers. This event is sponsored by the Down Syndrome Association of Middle Tennessee. Participants enjoyed themselves throughout the day as they participated in activities with their siblings, parents and the Belmont student volunteers.